Catherston What a Dream, aka Whatty, was bred in 2004 by Anthony and Jennie Loriston- Clarke of Catherston Stud in Great Britan. She is a British Warmblood by the Hanoverian stallion Wolkensdream, out of Catherston Dream Machine, who is by Dutch Dream. This is a very successful line of horses with many placings at the International FEI Level. Whatty competed with Jennie's daughter, Lizzie Murray successfully at the Small Tour level, including winning Regional Championships at Advanced Medium and PSG before being imported to the United States in 2010. Whatty came to Silver Oak Farm in 2016 and Patricia is working to bring her back into the show ring. In March 2018 Whatty had a beautiful colt by Catherston Stud's exciting young stallion, Timolin (by Totalis out of Samira) for Patricia's student Liz Jannaman. Whatty and Patricia will be back at work soon and are hopeful for the future! 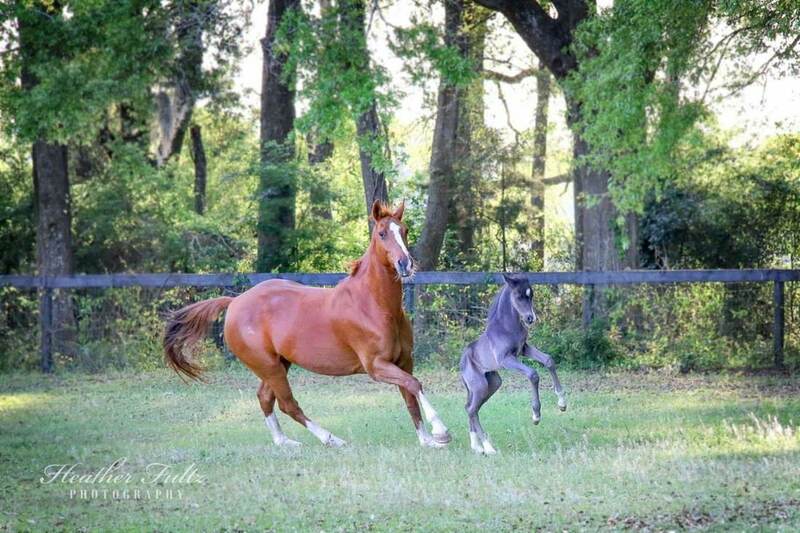 Timolin, the sire of Whatty's beautiful 2018 foal, Twas a Dream who is pictured below.